Westside Road is a narrow, picturesque, two-lane road running along Okanagan Lake in the BC interior. Its dramatic beauty and winding roads make it a pretty popular route for motorists of all types. 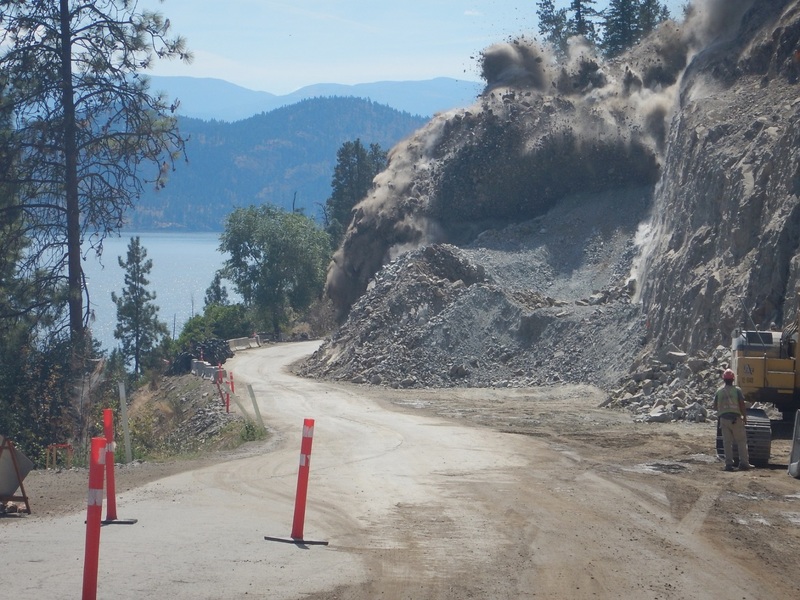 To keep this road safe and accessible for everyone, we’re widening and realigning 1.2 km of the road between Four Mile Creek and Waterfront Farm (north of the Highway 97 and Westside Road interchange in West Kelowna). Shoulder widening and pullout construction, plus over 30 km of resurfacing. 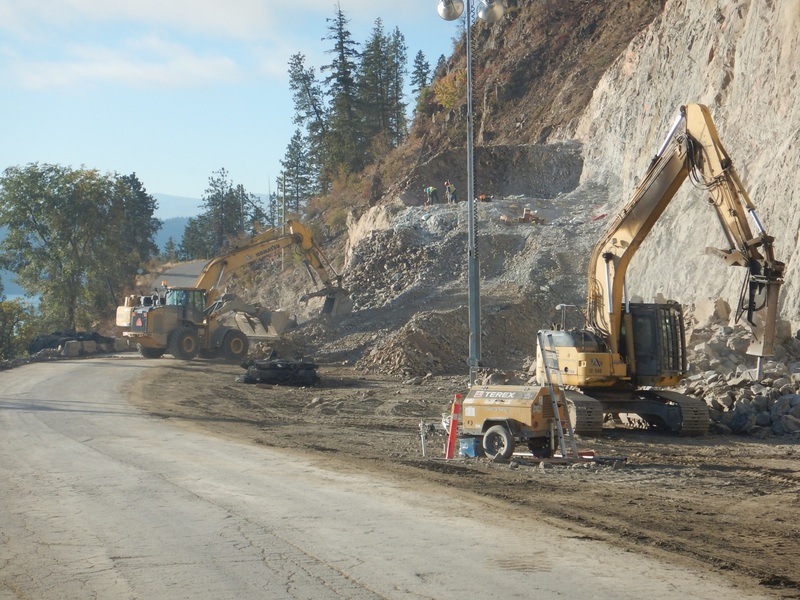 Work on a 500 metre section between Blue Grouse to Jenny Creek which widened the road to include a paved shoulder and the improvement of rock catchment ditches in areas of potential rock fall. Cinnabar Creek focused on 280 metres of a narrow two-lane section and the realignment of 2 curves and replacement of a 600m culvert. Waterfront Farms to Blue Grouse which focused on the widening and realignment of an 800 metre section of the road. Construction included: road base reconstruction, resurfacing, the addition of paved shoulders and rock fall protection. An excavator removes rock from high above to help widen the road and improve safety. Westside Road Represent! Do you have any questions about this or any other work we do? Let us know in the comments below. I m new to the area and am wondering what the Westside road is like from Fintry, North and back to Vernon in the winter time? Thanks for the question. Weather conditions can change quite a bit. I would recommend getting familiar with DriveBC.ca to help you know before you go when winter hits. Is the road straighter going north from Fintry, than it is going south to west kelowna? Looking at Google Maps, it appears that Westside Road may the slightly straighter going north from Fintry, than south to West Kelowna. The biggest curves on the road seem to be between Fintry and Westside Road. While the work you have done so far is nice and needed, that last project to four mile creek that was completed in 2017 has left the transition to the old road as one lane, poor signage and no advance notice northbound ( which is supposed to yield to southbound traffic). It is now more dangerous that then whole section that was replaced! And there are no guard rails there. So when the tourists come this summer I expect that there will be at least one or more cars that will end up down the embankment into the Lake. There was to be a last section between pine point and this last section to be done 2017-2018 according to and now I cannot find it listed. The project manager has responded to your comment directly. Please let us know if you have any other questions. I don’t care about what you have done….. Because a lot of it is still dangerous! Tell me what plans you have to keep improving it! We are currently widening and realigning 1.2 km of the road between Four Mile Creek and Waterfront Farm and are looking at other areas for improvement as well. i want to know if you are going to allow commerical vehicles example chip trucks logging trucks and super bee trucks to use that route to bypass the truck scale on hwy. 97 north of vernon.? We have sent your question forward to the area office for review. Stay tuned. Our Commercial Vehicle Safety Enforcement program has fixed scales and portable officers who patrol our highway network, including Westside Road. Commercial vehicles are allowed to use all highways, provided they are within the requirements of legislation. Hope that this helps!